Harbour Island Rum Company is releasing Afrohead a premium aged dark rum crafted in the Bahamas, into the US. Blended in small lots by rum savant Toby Tyler, the rum has a RRP of US$34.99 for the 7 year old, US$59.99 for the 15 year old XO. It is now available throughout the Bahamas and Florida and being shipped to further US states. Beyond the rum, the brand has a much deeper‐rooted story behind it. In 2008, Joe Farrell, as a proprietor of The Landing Guest House and Restaurant in Harbour Island, began hand bottling the un-named rum Tyler had crafted and serving it to guests. On the label, he used a simple graphic he had designed for the restaurant’s house wine – a stylized image that paid tribute to the island’s culture, Bahamian women and the first Miss Bahamas from 1963. 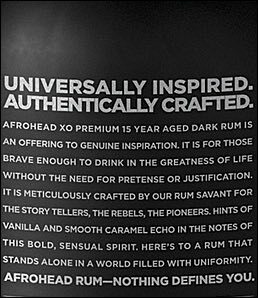 Locals and visitors from around the world came to Harbour Island to enjoy the rum with the ‘afrohead’ on it, and so Afrohead Premium Aged Dark Rum was named. Today, the bottle’s new icon continues to pay tribute to its original inspiration by incorporating six symbols representing the rum’s West Indies culture. The crown, junkanoo, mind’s eye, rising sun, creation and sea shell are all subliminally hidden within the icon. Production for Afrohead begins with sugarcane molasses sourced from around the West Indies, in particularly the Dominican Republic. It is then fermented using a yeast strand, proprietary to Trinidad that is more than 100 years old and creates its banana and toffee base. After distillation, the rum is aged in once‐used, charred bourbon oak barrels and aged for a minimum of the years indicated. Finally, the aged, dark rum travels to Barbados for bottling. The 7‐year blend can be appreciated in mixed drinks, neat or on ice. The 15-year XO deserves the respect of being enjoyed straight up. Harbour Island Rum Company supplies premium aged dark rums to the global spirits market. Afrohead rum will be available in craft cocktail bars, fine restaurants, boutique hotels and liquor stores in the Bahamas, South Florida and shipped to certain states via www.VintageLiquor.com.